← Are You Ready to Dive into Being a Caregiver? When it comes to driving, your senior may run into trouble at some point. There are a few big areas that can pose driving difficulty for your aging adult. 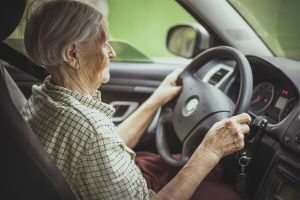 Whether the route is a new one for your senior or simply one that she doesn’t travel often, it’s often disconcerting to drive in unfamiliar locations. Planning out the route that is easiest before your senior sets out can help quite a bit. There may be some routes that she never wants to drive, however. Certain parts of town might be considered high traffic areas no matter what time of day it is. Others might be highly congested during certain times, such as during morning or afternoon rush hour. Paying attention to the time of day can help your senior to know whether it’s a good idea to either plan an alternate route or change appointments for another time. Lighting and the different ways that it affects how your senior sees is a big part of her driving experience each time she’s in the car. On a clear day with plenty of natural light, your senior may be a fantastic driver. But at dawn, dusk, or even full dark, shadows and light can make your senior uncertain about what she’s seeing and that can lead easily to an accident. Bad weather is a huge problem for all drivers, but it can be exceptionally challenging for your aging adult. Snow, ice, rain, and so many other weather conditions can be incredibly distracting for your elderly family member. These weather conditions can also make controlling the car that much more difficult for her. As your elderly family member’s health changes, so too does her physical strength and ability to control the car. She may also find that her hearing and vision change, which leads to difficulties knowing what’s going on around her. Some of these changes can be improved with exercise, a new glasses prescription, or a hearing aid. Others may not be something she can change. Avoiding some of these situations can add a lot of peace to your senior’s life as well as to yours. If you’re not able to do all the driving for her, consider hiring home care providers to do the driving for her. Home care providers can ensure that she’s safely getting where she needs to be without having to stress herself out by driving in conditions that aren’t healthy for her. For Home Care Services in Bartlett TN, please contact the caring staff at Personal Care Services MidSouth today! This entry was posted in Home Care Bartlett TN, Safety at Home and tagged Home Care Bartlett TN. Bookmark the permalink.